Everyone likes frequent flyer points, but for airlines, they create an ongoing management challenge of making enough seats available so that customers can redeem their awards. If the airline reserves too many seats for frequent flyers, then paying passengers cannot purchases seats. Conversely, if there are not enough seats for frequent flyer award redemptions, then loyalty customers become dissatisfied, and the airline’s financial liabilities for points accrual will rise. Maximizes revenue from paying passengers. Sabre’s new loyalty redemption optimizer prototype integrates airline network revenue management (RM) technology together with price elasticity models to determine the optimal availability of frequent flyer redemption seats and the $/points conversion rates for each market in an airline’s network. We adapted Sabre’s advanced, O&D revenue optimization capabilities to incorporate the additional dimension of frequent flyer award redemption, and the results jointly address airline loyalty and RM objectives. 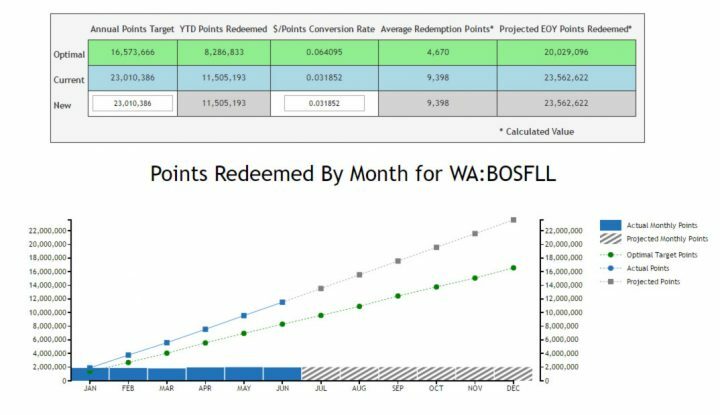 The outputs of this new decision support tool are used to generate frequent flyer point conversion rates (i.e. $/point) which provide flexibility to redeem awards using points or a mix of cash + points. It also allows the points required for flights to vary dynamically based on the available airfares. The model is also used to estimate optimal frequent flyer redemptions by market across the network, and these outputs can be used by the airline to set redemption sales budgets by market. Our prototype includes a user interface which shows the redemption points required by fare type and market as well as tracks the actual sales performance against budget (which allows airline loyalty analysts to adjust the $/points conversion rates as needed to stay on target). Our tests on airline historical data have shown that considerable revenue improvements are possible (potentially up to 1%) due to better coordinated airline loyalty and revenue management decisions.